Why is government distrust rampant, especially in the rural United States? 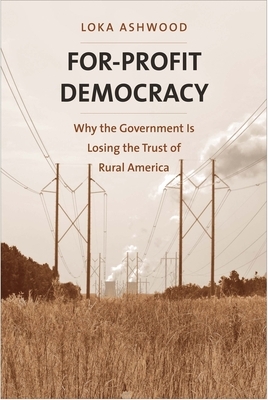 This book offers a simple explanation: corporations and the government together dispossess rural people of their prosperity, and even their property. Based on four years of fieldwork, this eye‑opening assessment by sociologist Loka Ashwood plays out in a mixed‑race Georgia community that hosted the first nuclear power reactors sanctioned by the government in three decades. This work serves as an explanatory mirror of prominent trends in current American politics. Churches become havens for redemption, poaching a means of retribution, guns a tool of self‑defense, and nuclear power a faltering solution to global warming as governance strays from democratic principles. In the absence of hope or trust in rulers, rural racial tensions fester and divide. The book tells of the rebellion that unfolds as the rights of corporations supersede the rights of humans. Loka Ashwood is assistant professor in the department of agricultural economics and rural sociology at Auburn University. She is a former award‑winning journalist whose work has been published in books and sociological journals. "Loka Ashwood delivers a lyrical narrative detailing the inspiring struggles of rural Americans against an unforgiving state and market system. This is a work of great depth and value for us all. "—David N. Pellow, author of What is Critical Environmental Justice?